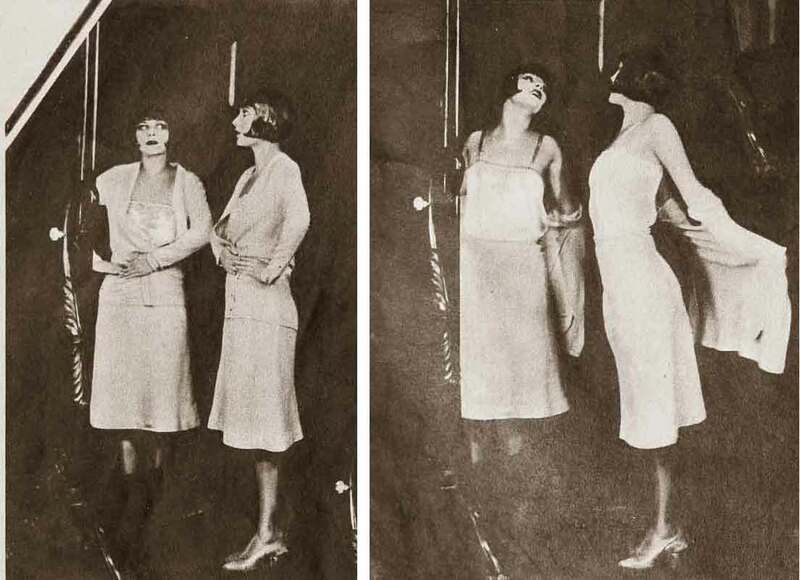 Modern Screen features The Sisters G – two unlikely stars of Paul Whitemans talkie revue ” The King of Jazz”. Direct from Paris – these two rubber legged Dutch bobbed beauties have become unexpected stars in their own right after their dazzling performance. Karla ( or is it Eleanor? ), looking into a mirror in which there is room for reflection, finds her double there – standing by herself, making both ends meet! Seeing a removing picture, revealing two reasons why she is a dancer, and supporting her! And Eleanor ( or is it Karla?) also sees a glassful – her born image proving her dress is low, wide and handsome, holding onto herself, and turning about! Then they both rock with laughter, and stepping out. It’s a frame up !